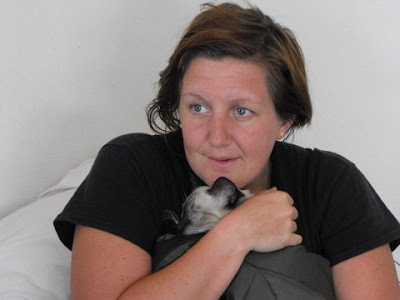 Kitty was returning to London via Lima, Peru. Ed and I had decided to take a break and drive her as far as Puno, on the Peruvian side of Lake Titicaca, where she could get a bus direct to Lima. On New Year's Eve morning we left Sky Hacienda in the capable hands of our new resident caretaker, Rosando. 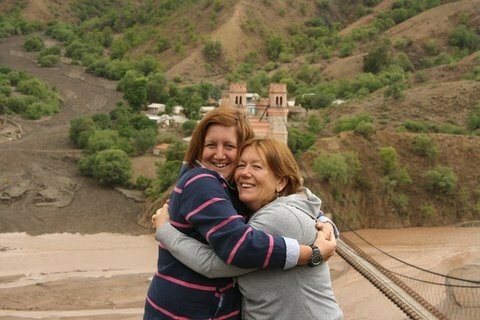 We had a photo op at Puente Mendez on the road to Potosi. Kitty wanted to make a quick stop in Potosi, the highest city in the world. We wandered around in the sunshine, and popped our heads into the beautiful Casa de la Moneda, (Money Museum) before it closed for lunch. 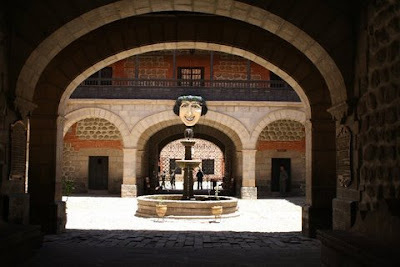 Then it was time to move on to Oruro, where we planned to break our journey to Lake Titicaca. 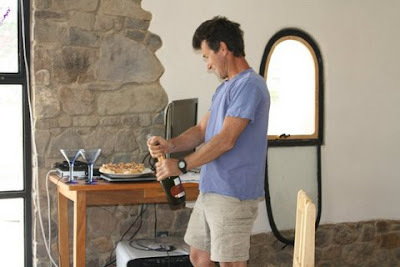 We had transported another bottle of Italian fizz on ice to celebrate the New Year. Ed has a habit of ejecting the cork with maximum velocity, which is why you see Kitty looking so apprehensive in our hotel room. 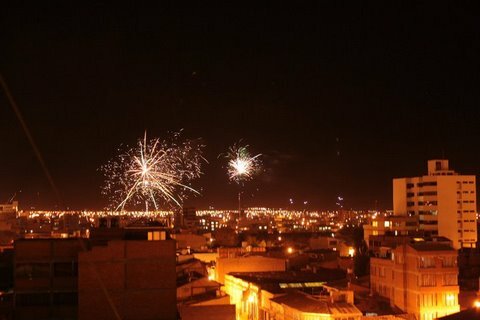 Although very weary from the long drive, we managed to stay awake long enough to enjoy the fireworks from our balcony at midnight. 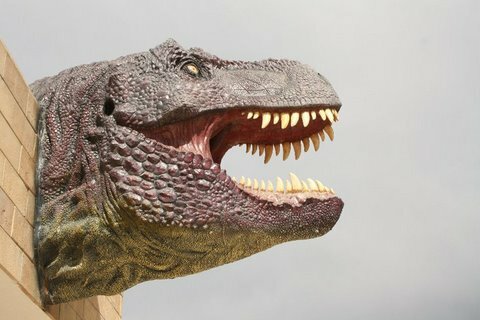 Kitty only had a few days with us after Christmas so we decided to show her some of the local attractions. 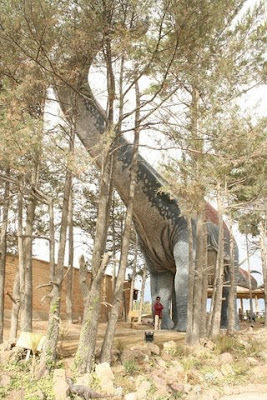 We went to the Dinosaur Park in Sucre. 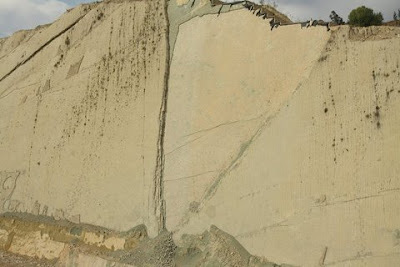 If you look closely you can see the dinosaur footprints on the left of the photo. Ed is dwarfed by the model of one of the prehistoric monsters! We went to the rural town of Tarabuco which is popular with tourists for its indigenous Sunday market. The town is also famous for having routed the Spanish in a clash before independence was declared in Bolivia. 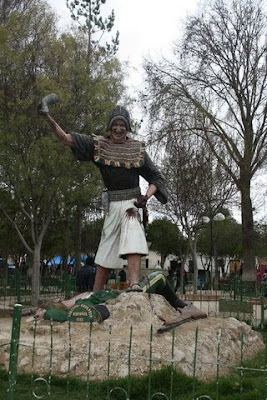 The statue in the town square shows a triumphant inhabitant holding in his hand the heart ripped out of a Spanish soldier. 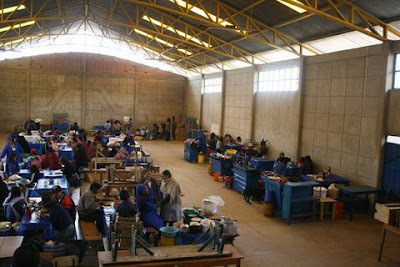 There are no fancy restaurants for tourists - lunch in the market is served in a large hanger. 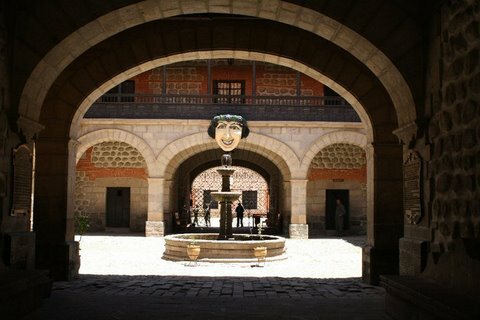 We also took some trips into Sucre to visit museums, restaurants and parks. 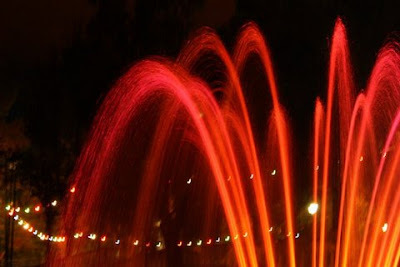 Sucre has a musical fountain show in Parque Bolivar every Friday evening. In the days leading up to Christmas we go crazy decorating the master bedroom/living room. The fairy lights on the tree reflect in the window and light up the adobe floor. 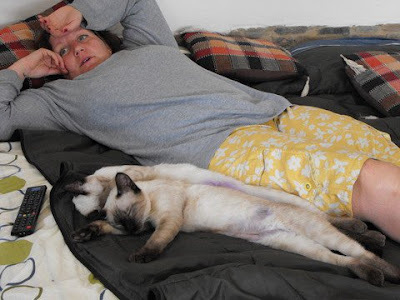 Kitty enjoys cuddles with Sumaq. 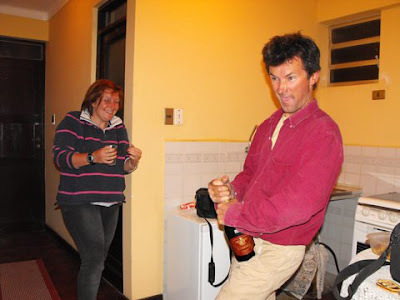 On Christmas Day Ed pops the cork of the nearest thing to champagne we can buy here in Bolivia - sparkling wine from Italy! 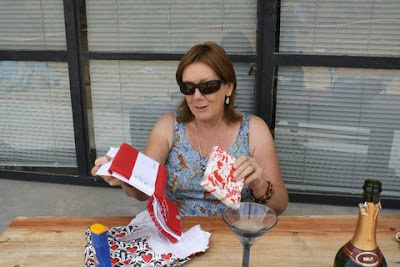 ....and June opens presents from family back in England. 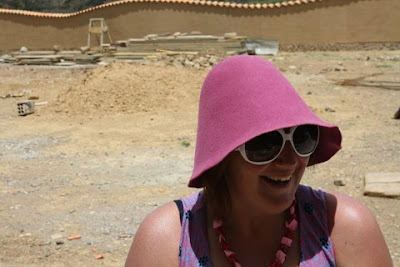 Kitty tries out her new Bolivian hat and Xmas shades as she starts the barbecue. 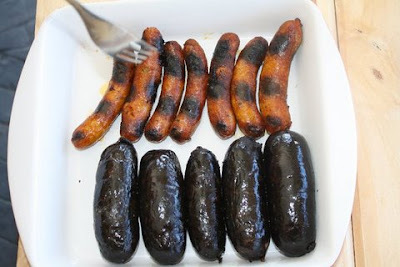 Chorizo and morcilla - mmmmm! 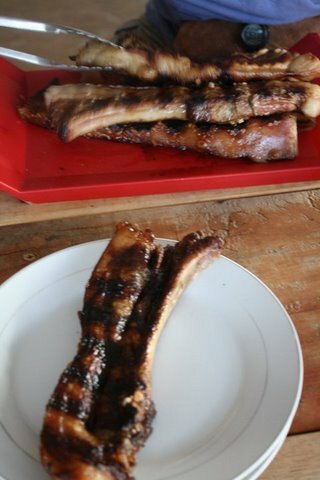 Next course finger lickin tasty pork ribs. Not a vegetable in sight! Then it's time to flop in front of the TV to watch the best - or worst - of the south american festive programmes. 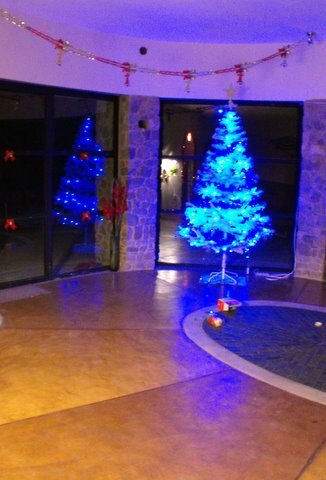 CHRISTMAS, AND KITTY, IS COMING! Our workers take a well-earned couple of weeks break for their annual holiday, and our thoughts turn to the arrival of my daughter Kitty from England for Christmas. 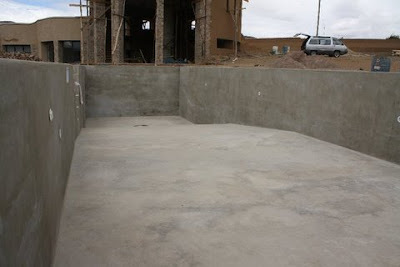 We have been working hard to to get the pool finished, but she arrives with the painting still to do. Kitty immediately gets into her bikini and to work with the paint roller. Only when the pool is finished does she put her feet up. The pool looks so different with its new colour and even bigger. You can just see Ed in the corner sweeping up. Of course, the pool is enormous for two people, but will be used by our guests when the business is up and running. 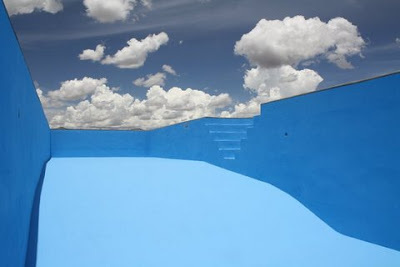 Kitty takes an amazing photo from inside the pool. 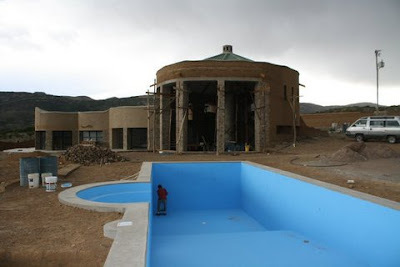 Sadly she is not able to use the pool during her short stay as the paint must cure for 10 days without rain before it can be filled with water. With the floor of the pool complete our workers quickly moved on to building the walls. Wooden forms were placed on the inside of the reinforced steel and braced with posts to prevent collapse from the pressure of the cement. The steps were lined with thin sheets of plywood and filled with cement. 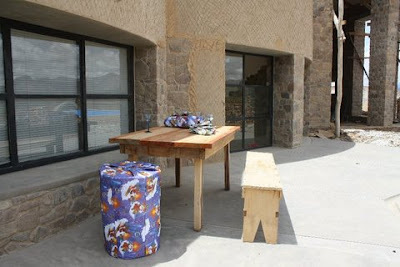 ......and the result is perfect - a great place for our future guests to sit and cool off. Our maestro, Geronimo, surveys the pool once the posts and forms are removed. There is a bit of final polishing to be done, but our team have done an amazing job. The pool was covered with tarpaulin to protect against sun and rain. We hired a cement mixer to supplement our own. ....and tipped down our makeshift chute to our workers below. The mix was roughly spread over the reinforcing steel and then levelled out with wooden beams. The surface was then trowelled out. Our men worked until 2 am polishing out the drying concrete. They slept on site and then went home for a well deserved day off.